advinda gives users the opportunity to work together as a team. The designated Team Admin can set up a team name and send out invites directly from the Team Settings page for other users to join the team. Once the invite is accepted, the invited user is automatically added to the team. Note: You can be member in one team at a time only. 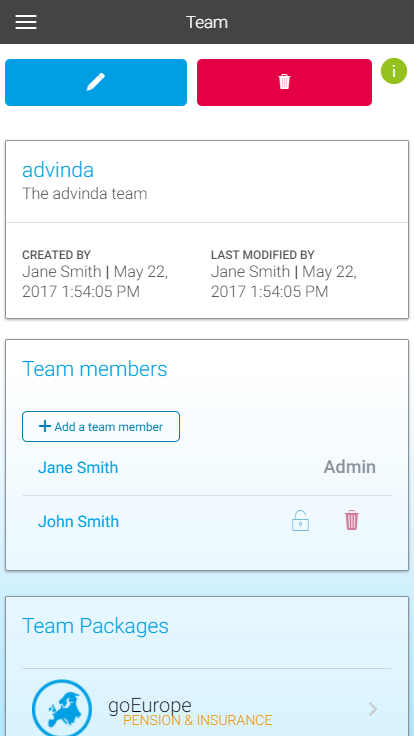 A user already registered to advinda will receive an email to confirm that he/she wants to join your team. Once confirmed, the user will be part of your team. You can click on a team member name to see the team member´s details. The third section, Team Packages, shows all the packages you have available. As the team admin, you can assign packages to your team members.